I crashed yesterday, but have nothing to show for it. Though it was a hard fall at slow speed on a very steep (almost vertical) hillside in rocky terrain, nothing was broken. Barely a few scratches. This is exactly the crash and results I’d been hoping for. I am a bit sore today, however! Rescuing a 350 lb. motorcycle with a high center of gravity on a steep hillside is very tough. No… extremely tough. 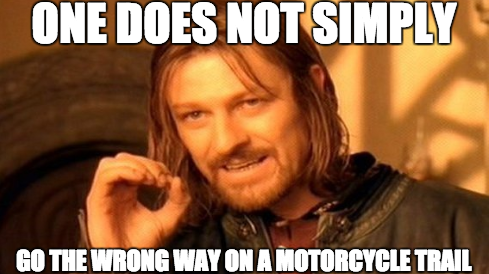 Especially when the trails I’m on are one-way. The direction of this trail was uphill. The fallen DRZ, as well as my body, wanted to go downhill which was the wrong way. I put everything I had into deadlifting that bike the first time. What I didn’t realize was that it would fall over on me three more times before I would successfully get up that hill. When 350 lbs. falls into my 180 lb. body on a steep hillside I tumble a bit, come to my senses, and realize I have to hike back up to try it all over again. Learned a few things today. 1. In this situation, no matter how hot, keep your helmet and goggles on. I did and every time I took a tumble my head and eyes were far better protected from the rocks and scattered tree limbs. 2. Sometimes you have to muscle your way out of it. Because I exercise and train hard I was able to lift my bike more than once. I would have been stranded otherwise, or would have made a bad situation worse by acting out of desperation in a very dangerous setting. 3. I need to start wearing my hip and knee pads.